PRESTENE GARNENEZ spent her youth running around the red sandstone bluffs of Red Lake-Navajo... truth be told, she was actually supposed to be herding her Mom's sheep. Sheepherding afforded her the opportunity to appreciate nature and all her surroundings as well as provide quiet time to read. Drawing upon her experiences, Ms. Garnenez pursued the study of science and nature (Biology/Mathematics) and later--of human nature-- a Master's degree in Planning with emphasis in Community Economic Development and Enviromental Analysis. Since returning home, she's been a passionate advocate in the revitaliztion and balanced growth of her community, Red Lake-Navajo. 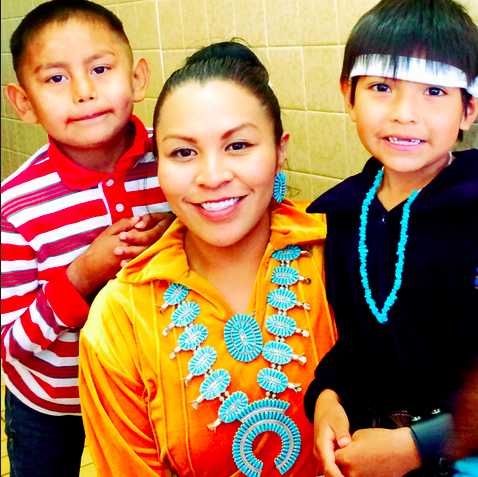 She is also a foundin﻿g member of the local grassroots organization, the Red Lake-Navajo Community Action Group which strives to improve the quality of life in the Red Lake-Navajo community. She also holds officer positions with two other boards/commitees: Vice-Chairperson, for a local housing non-profit and the President of the Red Lake #18 Chapter’s Community Land Use Planning Committee. Gavin Sosa: Gavin moved to New Mexico in 2002. He taught English/Language Arts for 6 years in the small town of Navajo, NM. He was also a successful cross country and track coach with his girls and boys teams winning numerous State Championships. After leaving the classroom in 2008, Gavin attended Stanford University's Graduate School of Education, earning his master's degree in education leadership. After completing his degree he returned to the Southwest, working as a Leadership Fellow at the Native American Community Academy (NACA) in Albuquerque. As a NACA Leadership Fellow, Gavin worked with NACA's founders and administrators to learn about the charter school start-up process and school leadership. In 2012, he moved to Shiprock to coach the Dine College cross country and track programs, and to work with the Dream Dine Charter School founding team. Along with working with the students, staff, ad families of Dream Dine as Director of Operations, Gavin was also involved with various community projects across Shiprock. After leaving Dream Dine in 2016, Gavin got married to his beautiful wife and moved to Kayenta, Arizona where he worked as a classroom assistant and continued coaching. In July 2018, he moved to Houck, AZ where he works as the Native American Baha'i Institute as the Operations Manager. He continues to volunteer in his community, working with children, youth, adults, and elders while also serving as a member of the DEAP Governing Council.